In part 2 of the Computer Vision Tutorial Series we will talk about how images are stored in a computer, as well as basic image manipulation algorithms. 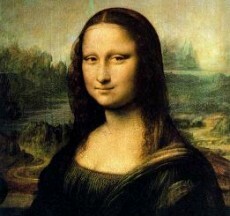 Mona Lisa (original image above) will be our guiding example throughout this tutorial. The very first step would be to capture an image. A camera captures data as a stream of information, reading from a single light receptor at a time and storing each complete 'scan' as one single file. Different cameras can work differently, so check the manual on how it sends out image data. There are two main types of cameras, CCD and CMOS. A CCD transports the charge across the chip and reads it at one corner of the array. An analog-to-digital converter (ADC) then turns each pixel's value into a digital value by measuring the amount of charge at each photosite and converting that measurement to binary form. CMOS devices use several transistors at each pixel to amplify and move the charge using more traditional wires. The CMOS signal is digital, so it needs no ADC. When storing or processing an image, make sure the image is uncompressed - meaning don't use JPG's . . . BMP's, GIF's, and PNG's are often (although not always) uncompressed. If you decide to transmit an image as compressed data (for faster transmission speed), you will have to uncompress the image before processing. This is important with how the file is understood . . . In every image you have pixels. 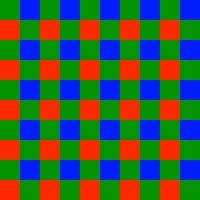 These are the tiny little dots of color you see on your screen, and the smallest possible size any image can get. When an image is stored, the image file contains information on every single pixel in that image. This information includes two things: color, and pixel location. Images also have a set number of pixels per size of the image, known as resolution. You might see terms such as dpi (dots per square inch), meaning the number of pixels you will see in a square inch of the image. A higher resolution means there are more pixels in a set area, resulting in a higher quality image. The disadvantage of higher resolution is that it requires more processing power to analyze an image. When programming computer vision into a robot, use low resolution. Images are stored in 2D matrices, which represent the locations of all pixels. All images have an X component, and a Y component. At each point, a color value is stored. If the image is black and white (binary), either a 1 or a 0 will be stored at each location. If the color is greyscale, it will store a range of values. If it is a color image (RBG), it will store sets of values. Obviously, the less color involved, the faster the image can be processed. For many applications, binary images can acheive most of what you want. It has a resolution of 7 x 5, with a single bit stored in each location. Memory required is therefore 7 x 5 x 1 = 35 bits. It has a resolution of 7 x 6, with 8 bits stored in each location. Memory required is therefore 7 x 6 x 8 = 336 bits. As you can see, increasing resolution and information per pixel can significantly slow down your image processing speed. The first method is just delete 1 pixel out of every group of pixels in both X and Y directions of the matrix. and will result in a 4 x 3 matrix, for memory usage of 96 bits. Another way of decreasing resolution would be to choose a pixel, average the values of all surrounding pixels, store that value in the choosen pixel location, then delete all the surrounding pixels. Using the latter method for resolution reduction, this is what Mona Lisa would look like (below). You can see how pixels are averaged along the edges of her hair. While the above method reduces image file size by resolution reduction, thresholding reduces file size by reducing color data in each pixel. To do this, you first need to analyze your image by using a method called heuristics. Heuristics is when you statistically look at an image as a whole, such as determining the overall brightness of an image, or counting the total number of pixels that contain a certain color. 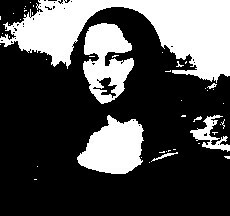 For an example histogram, here is my sample greyscale pixel histogram of Mona Lisa, and sample histogram generation code. In this particular thresholding example, we will convert all colors to binary. How do you decide which pixel is a 1 and which is a 0? The first thing you do is determine a threshold - all pixel values above the threshold becomes a 1, and all below becomes a 0. Your threshold can be chosen arbitrarily, or it can be based on your heuristic analysis. As you can see, setting a good threshold is very important. In the first example, you cannot see the triangle, yet in the second you can. Poor thresholds result in poor images. Note that if the threshold was 1, the entire image would be black. If the threshold was 255, the entire image would be white. Thresholding really excels when the background colors are very different from the target colors, as this automatically removes the distracting background from your image. If your target is the color red, and there is little to no red in the background, your robot can easily locate any object that is red by simply thresholding the red value of the image. 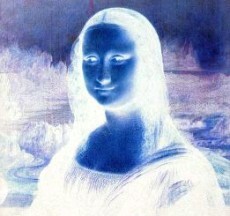 Color image inversion is a simple equation that inverts the colors of the image. I havnt found any use for this on a robot, but it does however make a good example . . . The problem with increasing brightness too much is that it will result in whiteout. For example, if your arbitrarily added value was 255, every pixel would be white. It also does not improve a robot's ability to understand an image, so you probably will not find a use for this algorithm directly. A 1D image can be obtained from use of a 1 pixel sensor, such as a photoresistor. As metioned in part 1 of this vision tutorial, if you put several photoresistors together, you can generate an image matrix. You can also generate a 2D image matrix by scanning a 1 pixel sensor, such as with a scanning Sharp IR. If you use a ranging sensor, you can easily store 3D info into a much more easily processed 2D matrix. 4D images include time data. They are actually stored as a set of 2D matrix images, with each pixel containing range data, and a new 2D matrix being stored after every X seconds of time passing. This makes processing simple, as you can just analyze each 2D matrix seperately, and then compare images to process change in time. This is just like film of a movie, which is actually just a set of 2D images changing so fast it appears to be moving. This is also quite similar to how a human processes temporal information, as we see about 25 images per second - each processed individually. Actually, biologically, its a bit more complicated than this. Feel free to read an email I recieved from Mr Bill concerning biological fps. But for all intents and purposes, 25fps is an appropriate benchmark. Now that you understand the basics of computer image processing in our Computer Vision Tutorial Series, you may continue on to Part 3: Computer Vision Algorithms.